This record is goddamn insane. This is one of those death metal splits where not only can you see the bodies flying around the room during the release show, but you can see the scene forming up out of the sheer emotional power that these two groups bring to the fore. Crypt rot's side of the split in and of itself is something I've spun three or four sides today, whereas Cringe deliver the kind of weird and maddeningly fucked up potency that we can't help but to fall in love with as fans of the modern death metal scene. 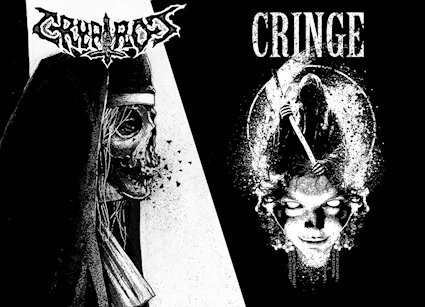 It's not secret that I think Crypt Rot is one of the most perfect young death metal bands going now, and the two tracks that they bring to the table here are among their best yet. They have progressed in leaps and bounds as composers whilst simultaneously touching on ever darker and thrashier corners of the OSDM genre. Meanwhile Cringe unleash some crushing beats that you can't easily dismiss. The sheer DIY magic of their release has me bopping along and the twisted glory of these tracks only continues to compound upon itself the deeper I dig into their three tracks. It's riffs, angry and a little bit over the top - just the way I like it. I think the thing that makes this split special is the sense of balance. That is to say, on the one hand you have the incredibly bombastic and in your face assault of Crypt Rot, on the other you have the tortured vocals and much more punk rock vibes of Cringe. It keeps you from getting overwhelmed and allows the listener to dig into several sides of extreme underground music on a single record. The assault of this split is, in a word, punishing, and it is one that I am sure to revisit many times in the coming year.